An informal business letter is a kind of business letter which is written to a close associate or partner within the business sphere. So here we are going to provide you with some useful tips to write an effective informal business letter. In the course of business, we might make many acquaintances with whom we develop close relations. So depending upon the relationship with the person, we can write them in an informal tone too regarding any formal communication. 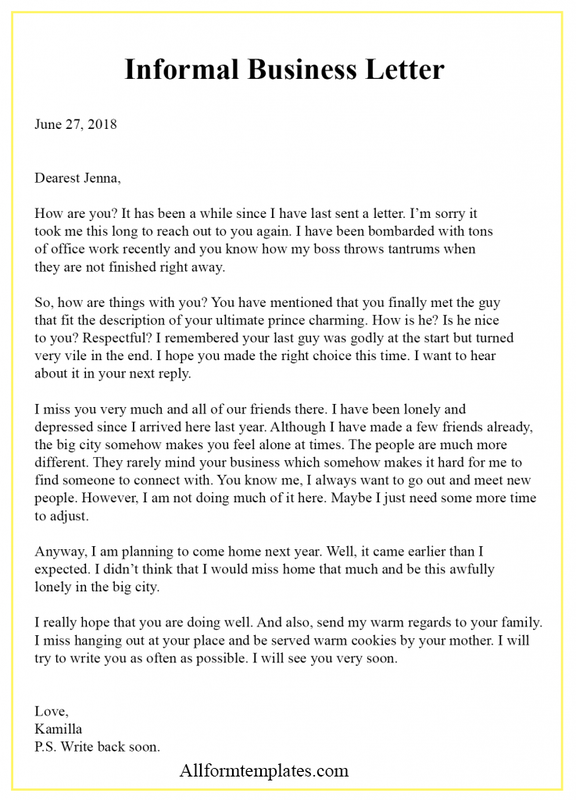 So here we present you with some templates related to an informal business letter in PDF format. Informal letters are mainly written for personal communication. These can be written for various purposes, such as inquiring about a business transaction, thanking someone for their recommendation, conversation regarding business plans, etc. So from here, you can find different templates of informal letters. You can use these letters for inspiration and pick ideas from it to write your own letter for an informal purpose. The informal letter is mostly written by business partners or close acquaintances regarding any business correspondence. It can also be written between two individuals who share a non-professional relationship. Hence the letter does not need to follow any standard format or tone of language. You can write it depending upon the relationship you share with the recipient and it may even contain emotional or personal undertones. Although it is an informal letter, it must follow a standard format. The letter must start with writing the sender’s address. Writing your address is a must even if the recipient knows you well. It is to remove any doubt in the mind of the receiver. regarding the identity of the recipient. After that, you can start by writing an informal greeting. Since the tone of the letter is casual, you can write the greeting according to your preference. Writing an informal business letter is the same as writing any other informal letter. The only difference is that this letter is written to our business acquaintances for the purpose of business inquiry or communication. Your letter must be properly structured with an introduction, body, and closing. In the introduction, you can use an informal greeting and begin the letter by mentioning your intention of writing the letter. In the next paragraph or the body of the letter., you can write about any details pertaining to why you are writing the letter or out up any secondary questions related to your intention of writing the letter. In the closing paragraph, you can mention by putting that you hope to hear from them soon and send your warm greetings. 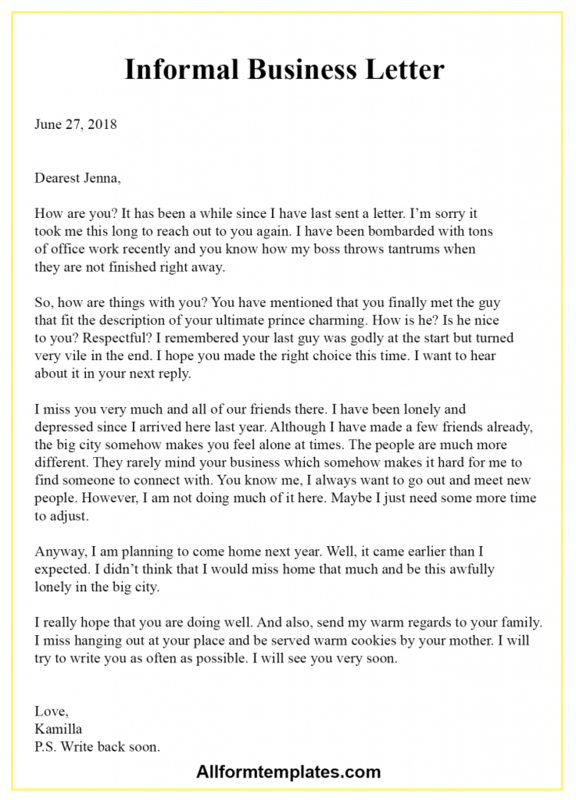 Here we have provided you with some examples of informal business letter templates. You can download these and print them in PDF format. 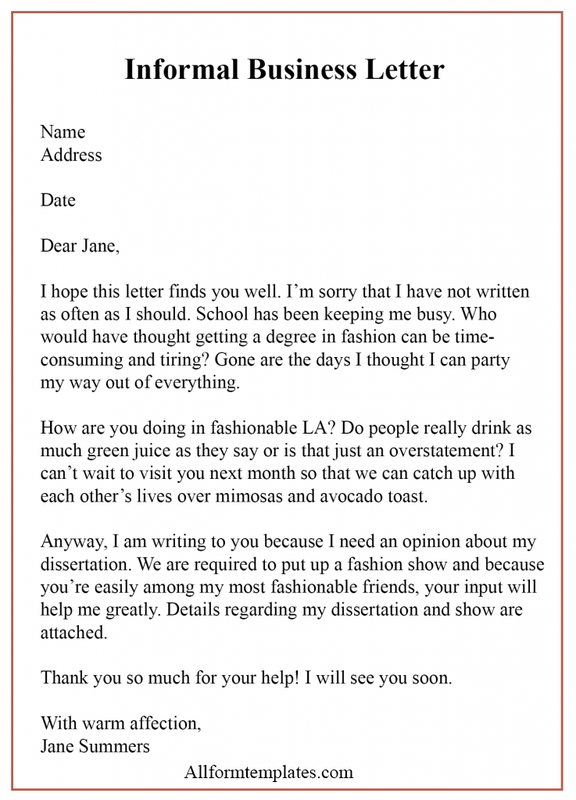 So you can use these templates as a reference next time you need to write an informal letter. These will surely help you write a proper informal letter and you can make an impact upon the reader through your letter.